There is no bond quite like that between mother and child. 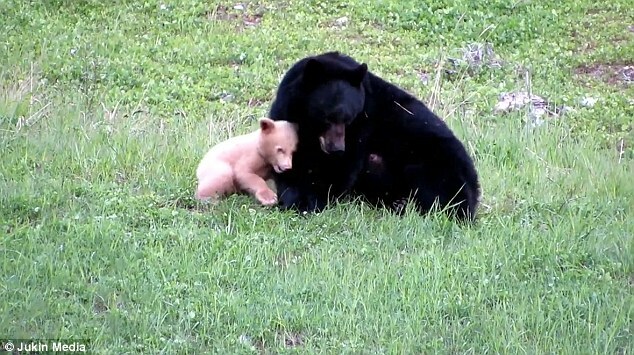 And bears are no exception to the rule, as adorable footage shows. 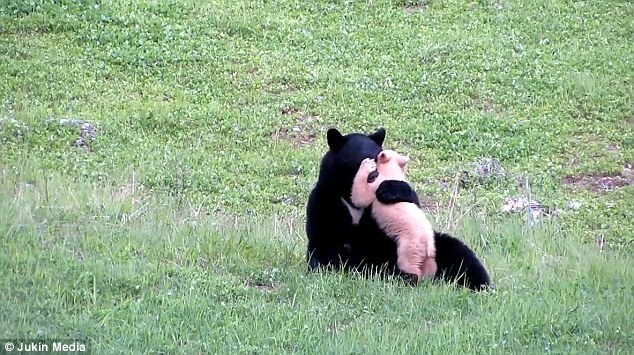 The video, filmed in Whistler, Canada, shows a black bear rolling around with her little cub - who is completely white. In one particularly touching scene, the black bear rolls on her back while her little cub clambers on top of her. And the cub can't help but show his love for his mother - he constantly jumps up on her and bats her face with his paws. Due to their special color and rarity, the kermode bear is revered by local Native American culture. They are referred to as the spirit bear or ghost bear. According to Native American legend, the spirit bear is a reminder of times past, specifically the white color of ice and snow. The master of the universe created one white bear for every ten black bears as a reminder of the hardships during the ice age. During this period glaciers and cold blanketed the planet. The spirit bear also symbolizes peace and harmony. They are not related to the polar bear. Kermode bears mate during the summer months. When fall arrives the mother bear finds a suitable place to den such as a hollow tree trunk, rock shelter, or hillside dugout. They line their dens with dried grass, leaves, and twigs for comfort. Responses to "Touching Moment A Mama Bear Plays With Her Completely White Colored Spirit Bear Cub"